Industrial Bio Lynx is another masterpiece from Star Link in the segment of Industrial Models that serve its purpose of attendance perfectly. It features transaction storage of 5 lacs records while 9,560 finger templates can be stored in it. For double layer security, an internal color VGA camera is there which helps to capture the image of the persons while punching. The Industrial Bio-Lynx features multiple communication modes like Wi-Fi, GPRS, RS-232, USB and TCP/IP. This allows the user to get the data easily on a single click of mouse. Industrial Bio-Lynx is perfect device helping you by increasing the productivity of your firm. This device is versatile to be used at any kind of set-up and work place as it comes with heavy metallic body and built-in battery for 48 hours back-up. This device is also enabled with data push technology. 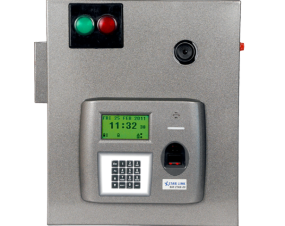 This device comes with LCD that displays the details of the employees, while a voice guided message provides the confirmation about the attendance. Industrial Bio-Lynx can also be customized according to the requirement. Battery: Inbuilt battery 7.2Ah-12V, back up of up to 48 hrs.